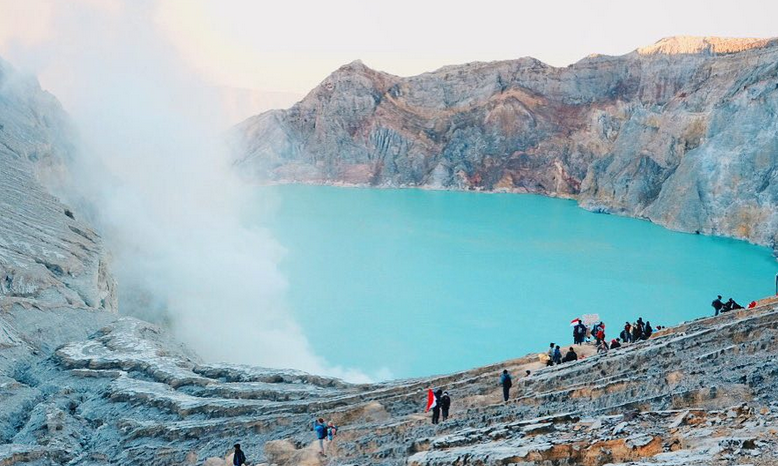 After seeing some of the pictures of Ijen Crater floating around on your social media, there is no doubt that you will love to witness the awesomeness by yourself. Offering the extraordinarily beautiful blue fire, Ijen is surely the greatest sulfur mine in Indonesia that is worth checking for! Located in East Java, Ijen Crater is for sure one of the most recommended places to visit in the region. For you who are interested to join the tour, here is the ultimate guide to get the most of the blue fire ijen tour. For good reason, there are some points that you better know before going for the tour. So, let’s check this out! First, you should know where to say when you join the tour. Since there are two possible routes that you can take to get into the crater, you can consider staying on the location near to the best route. Here are the options. Ijen Crater can be reached for one-hour drive from Banyuwangi. More interestingly, you will have a lot of accommodation choices when you stay in this town. Restaurants in Banyuwangi have endless variety too! Even though Bondowoso is further than Banyuwangi, there are still tourists that opt for staying in Bondowoso instead of Banyuwangi. It may not have various hotels, but it offers such beautiful view as a plus side. Second, you should know how you can get to the crater. The good news is that there are numerous companies that offer a tour to Ijen. You can consider using the best tour service around to get the most of your tour. For your information, some blue fire ijen tour packages are usually offered alongside with Bromo tour. If you are also fascinated to witness the wonderfulness of Mount Bromo, you can opt for this kind of package. Here are some things that you should prepare for the best experience in Ijen Crater. The smell of sulfur gas in the crater is highly strong. That’s why you should make sure to bring a mask or a piece of cloth that can cover your nose and mouth. Your tour guide may have prepared this for you, but it will be a good idea for you to bring it along with you in case they don’t prepare it for you. Sounds obvious but you should make sure to bring warm clothes with you especially a windbreaker since it is very cold on the summit. It can be a hard and exhausting tour to reach the blue fire Ijen Crater. However, it’s no secret that the result is just breathtaking that makes it worth the energy and time. Now, for you who want to go for this awesome experience, visit www.jogjabromotour.com and select your best tour package here.